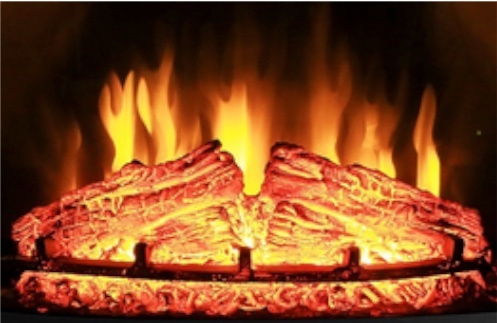 Are you thinking about buying an electric fireplace insert? Compared with traditional gas and wood fireplaces, an electric fireplace insert is cheaper to set up, requires almost no maintenance, and you never have to worry about your home getting smoky. 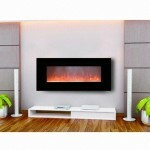 Today’s best electric fireplace inserts look extremely realistic and are just as cozy and beautiful as real fireplaces. Many also produce heat using an integrated heater to provide a relaxing fireplace experience. This 15-minute buying guide will help you find the best electric fireplace insert for your home. – how to install a fireplace insert properly (it’s easy). If you’re interested in other types of electric fireplaces, check out our more comprehensive guide to the best electric fireplaces in 5 different categories. Not enough time to read it all? Email this guide to yourself! If you are looking for an electric fireplace insert with the charm and feel of a traditional fireplace, this is the best choice. The fireplace uses SpectraFire flame technology to create super-realistic flames. 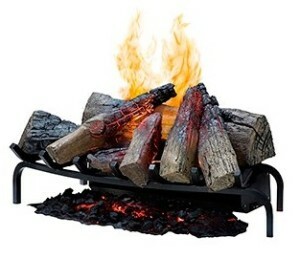 The log set looks very realistic as well with embers glowing and burning just like real logs. The only thing that might seem unusual if you are used to a real wood-burning fireplace is the lack of crackling sounds. But you can buy a fire crackler sound system separately and install it near the fireplace. A faux brick interior adds to the charm, making it feel like you have a real fireplace in the room. This fireplace insert comes with supplemental heat available in two output levels. When connected to a 120V voltage, it can warm a room of up to 400 sq. Ft. It can also be connected to a 240V voltage in which case; it can heat a room of up to 800 sq. Ft. Using the included remote control, you can set the temperature anywhere between 59oF to 86oF. You can also turn off the heat completely without switching off the flame effects. This lets you enjoy the fireplace all year round regardless of the weather. You can change the brightness of the flames and set an automatic switch off timer anywhere between 30 minutes and 9 hours. The Dimplex Synergy fireplace inserts blend seamlessly into a modern-styled home while still adding the warm charm of a traditional fireplace to your living area. The elongated design (it is 50” long), the black trim and the smooth glass front are perfect for a contemporary decor. This fireplace is designed for recessing or mounting on the wall. So you can get it even if you don’t have an existing fireplace at home. Just follow the simple installation instructions in the user manual. The glowing embers (which are actually pieces of glass) and the dancing flames create a very realistic effect that adds a nice ambience to the room. If you also need to chase away the chill, there is a heating option which you can turn on and off independently from the flame effects. There are only two temperature settings: low heat and high heat. There’s no precise thermostat like in most electric fireplace inserts. But the two settings are enough for most people’s heating needs. 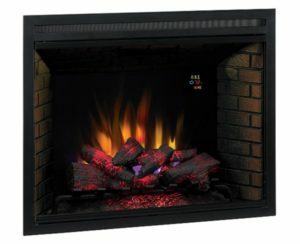 Electric fireplace inserts can be pretty pricey with most costing well over $1,000 and premium brands going for $2,000+. If you are looking for something cheaper, try this compact fireplace insert. It uses a very simple method to create a realistic fireplace effect. The logs have LED lights embedded in them. Their orange hue creates the appearance of glowing logs. The flames are created by moving flame-shaped metal fins that reflect light off their surface. For the price, this insert looks very realistic. The only thing missing is some smoke effects and crackling sounds. There are three flame brightness levels to choose from. So during the day, you can max out the brightness to make sure the fireplace is still visible. The insert also provides supplemental heat though it’s not much. It’s only effective in small rooms (around 150 square feet). If the room you are planning to use it in is bigger than this, you’ll only benefit from the ambience. Any heat produced quickly disperses before it reaches you. You can adjust the heat level using a remote control and turn it off/on separately from the flame effects. If you need a fireplace insert that can heat a small to the mid-size room, get this one. The integrated heater is rated at 2,700 watts (around 9,000 BTUs). It can comfortably warm a 400 square feet room. As you enjoy the warmth from the heater, you’ll also love the ambience created by the hyper-realistic log set and flames. The logs are handcrafted to resemble actual logs. LED bulbs are then embedded inside them to create the effect of glowing logs and embers. The flames also look very real though there is no option for changing their brightness or intensity. This is a dual voltage electric fireplace meaning you can connect it to a 120V or 240V power source. 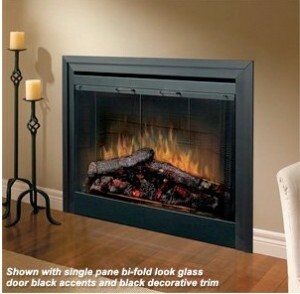 This is another great choice if you are looking for an affordable electric fireplace insert. It costs less than $300 but is just as realistic as other pricier inserts. The logs glow just like real logs, and the flames are super realistic as well. The jet-black backdrop inside the insert helps brighten up the flames and make them more visible even during the day. A faux brick interior gives the insert a nice traditional look. The AKDY firebox also comes with supplemental heating but only for small rooms (around 150 square feet). There are several heat levels, and you can turn the heat off completely while still leaving the flames on. Installation is simple. All accessories you need to fit it into an existing fireplace are included. As for power, it plugs into a standard 120V outlet. 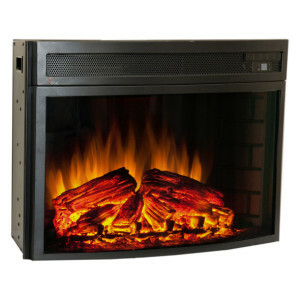 This is yet another good option if you are looking for an affordable electric fireplace insert. It costs less than $300 and includes a remote control and trim kit. The logs are handcrafted to offer a realistic appearance. Embedded LED lights give off a fire-like glow. The flames also look real as they dance and flicker against the black backdrop. There is no setting for changing the brightness or intensity of the flames. But there is a heater, though only ideal for small and medium-sized rooms. Rated at around 5,000 BTUs, it can comfortably warm a room of up to 400 sq. Ft. Using the included remote control, you can set the heater to full heat, half heat or no heat depending on the season. The Opti-Myst series of Dimplex electric fireplaces use ultrasonic technology to create an ultra-realistic appearance of fire and smoke. They have a water reservoir from where a mist is released. The fine water droplets reflect light to create the illusion of a fire. The mist also makes it seem like there is smoke rising upwards. This particular insert (the Dimplex DLGM29) doesn’t have a screen like most other electric fireplaces. It’s an open hearth. It feels more authentic and cozier. Now, the fire isn’t very big. Don’t expect a huge roaring bonfire. It’s more of a slow-burning flame. But it’s incredibly realistic especially with the glowing logs resting on a metal grate with burning embers underneath. I recommend buying a separate fire crackler sound system and set it up near the fireplace to add to the relaxing ambience. You need to refill the tank every once in a while (a full tank lasts 14-17hrs) but it takes just a couple of minutes. The included remote control allows you to turn on just the glowing logs or the glowing lows and flame effect. You can also turn the fireplace on/off from the remote. There are no other settings like flame brightness, colour or intensity. There is also no heat option. It’s a display-only fireplace insert. This cassette insert uses the same ultrasonic mist technology as other Opti-Myst models. Under the log bed, there is a water reservoir which lasts around 12-14 hours. The rising mist from the water tank creates the appearance of flames and smoke. The logs themselves have LED lights embedded in them to create a glowing effect. They are set on a grate-like structure to create a realistic fireplace effect. Dimplex says that this insert has a heat option, but it’s virtually useless. The heat output capacity is only 682 BTU. 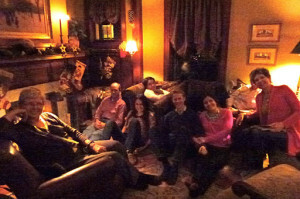 You won’t feel any warmth unless you are sitting right in front of the fireplace. So if you buy this insert, consider it to be display-only unless you are using it in a very small room. 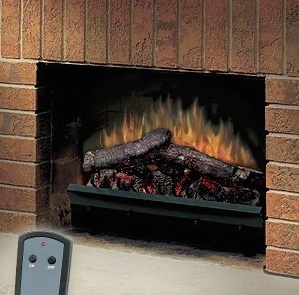 The remote control lets you turn on the flame only or flame and heat. There is also a thermostat for controlling the heat level (if you can feel any heat, that is). Installation is easy as long as you have an existing fireplace. As for power, it plugs into a standard 120V outlet. No hardwiring required. If you are looking for a fairly large fireplace insert that combines the perfect fireplace ambience with a room heater, the ClassicFlame 26” SpectraFire Fireplace Insert is a great choice. 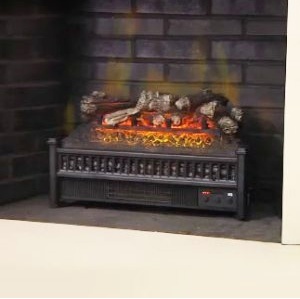 It’s one of the most versatile electric fireplace inserts. With five flame effects, five flame speeds and five brightness settings, there are 125 effect options in total. No other fireplace has this many options that let you set up the ambience exactly the way you want. You can adjust the flame color to something warmer, reduce the flame speed to a gentle fire and dim the brightness to create the perfect relaxing ambience. At 4,600 BTU the heater is enough for small and mid-size rooms. It can quickly warm up a 400 square feet room with the fan ensuring all areas are heated evenly. An auto shut-off timer saves energy if you fall asleep while enjoying the warmth and ambience. It’s also a handy feature to have if you are installing this insert in your bedroom. You can set the timer up to 9 hours. This insert also comes with Safer Plug Fire Prevention Technology which continuously monitors how hot the plug is and automatically cuts power if it gets too hot. So you can install it in any room with complete peace of mind. This insert is designed to provide the charm and ambience of a real wood-burning fireplace. The larger size and traditional design make it a décor center piece for your home, and its oversized logs and huge flames make it more realistic. But you can also get a modern styled version of this insert that uses rock crystals instead of logs. With the included remote control, you can choose from five different brightness levels. You can also turn the heat on/off separately from the flame effects, making it ideal for all-year-round use. The heater is rated at 4,400 BTU so it should warm up a 400 square feet room in no time. If it gets too warm, use the thermostat to select your preferred temperature (60-90oF). If you want more heat maybe for a bigger room, there is a 240V version available. It comes with an 8,900 BTU heater that is ideal for rooms of up to 800 square feet. There is a timer setting you can use to switch off the fireplace automatically. You can set it anywhere between half an hour and 9 hours. With its panoramic curved viewing screen, the Comfort Smart Verve provides a unique alternative to the same old flat and rectangular design of other fireplace inserts. A realistic flame and glowing logs and embers provide the traditional ambience of a wood-burning fireplace. The resin logs are hand painted to resemble real wood logs. 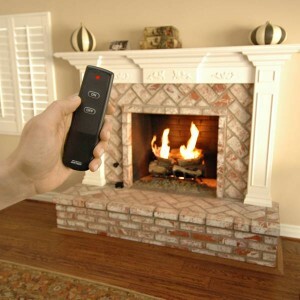 Multi-Function remote control lets you control the flame brightness as well as the ember effects. The 4900 BTU integrated heater (which can be controlled separately from the flames and logs) can quickly warm a room of up to 400 sq. Ft. There are six temperature settings you can choose from depending on the weather and your comfort preferences. Installation is simple and quick. It plugs into a standard 120V outlet, so you don’t need to get a pro to hardwire it. This is another excellent option if you are looking for an open hearth fireplace insert without a screen. 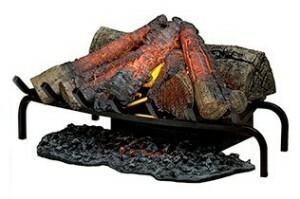 The realistic logs – which are handcrafted and molded from actual logs – sit on a metal grate. Underneath the grate, glowing embers create the illusion of small bits of hot charcoal burning. It looks very real and feels really cozy. To make them glow, the logs are embedded with LED lights that pulsate to give the appearance of real burning logs. There is also an integrated heater for a small to a mid-size room of up to 400 square feet. You can increase or lower the heat level using the included remote control. Other settings include flame speed control for setting the flame intensity, a dimmer button for setting the flame brightness and a timer that can be set from 30 minutes to 8 hours. The insert plugs into a standard 120V home outlet, so there’s no need to hardwire it. Seeking to repurpose your existing gas or wood-burning fireplace? Interested in upgrading your existing electric fireplace? Want to reduce the cost of heating your home? Then consider installing an electric fireplace insert. Within minutes of installing one in your room, you can be enjoying soft, warm heat and an incredibly realistic flame effect. We all know traditional masonry (brick) fireplaces look great, but most of us don’t know that traditional fireplaces are extremely inefficient ways to heat a living space. If you need inexpensive heat for your home but want to keep the beauty and comfort provided by your existing fireplace, then you may be interested in an electric fireplace insert. An electric fireplace insert is an electrically powered, non-venting heating element that is installed into an existing space – either installed into a mantle or simply slid into the empty space. You “insert” the unit into the old fireplace space and instantly upgrade its efficiency and heating capabilities. 1. select the heating capacity you need for your room – if any; some inserts just for decoration & don’t heat a room. 3. select the type of insert you need for your particular installation: a log insert, a built-in unit (called a “builders box”), or plugin-in unit. See below for an explanation of these. 4. select the size and trim: measure the width of your fireplace; decide whether you want trim around the edges; do you want glass doors? etc. 5. list any optional features you want. The most common are a remote control, a digital display and/or a timer. 6. shop for the best price. Your buying decision should be made roughly in this order, so you don’t waste time or make mistakes. The first thing to get clear is whether you’re looking for a heater or just a decoration. There are pros and cons to each. Heating units often cost more and require a fan, which can be noisy (check our reviews). There are two types of heat systems used in electric fireplace inserts: Fan-forced heat or infrared heat. Fan-forced heat is best for heating rooms up to 400 Sq Ft, while Infrared (IR) inserts can heat up to 1,000 square feet. There are also inserts available that provide the look and feel of a live fire without generating any heat at all (for decoration only). Many built-in modern units are like this. Consider the aesthetic of your room and your existing fireplace. 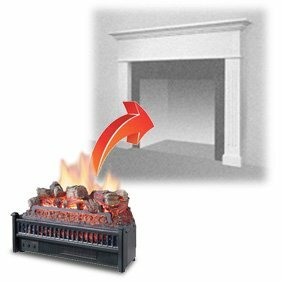 For a traditional room, choose a realistic-looking split log insert like the popular and inexpensive Dimplex DFI2309 or its upscale cousin, the Dimplex Opti-Myst Log Set. For a sleeker, more modern look, choose a built-in or plug-in unit with a full glass front and flush trim. There are three types of electric fireplace inserts sold today: log inserts, plug-ins and built-ins. Electric log fireplace inserts make use of a simulated log set that sits on top of a realistic grate. The heating component is located underneath the log set. An electric log insert is the best type for anyone who wants to convert a standard gas- or wood-burning fireplace into an electric one with a minimum of fuss. Installation is easy: just insert the log set into your existing fireplace and plug it into a standard 110v household outlet. An electric log insert will provide heat for a room of up to 400 sqft. Most log units, like the top-rated Dimplex 28″ Premium Log Set, include a flame effect that is either projected directly onto the back of the fireplace wall or on a back shield. If you are looking for a fast and easy way to convert an existing fireplace to electric, then a log fireplace insert is a great choice. The plug-in electric fireplace insert is a simple and inexpensive solution for anyone who wants to install an electric fireplace into a cabinet or mantel. Plug-in units are completely self-contained units, like a space heater. The units are fully enclosed on all sides and have glass fronts, which make them great for modern-style homes. The fan-forced heat output comes from the top of the unit above the heating element. Like electric log inserts, most plug-in inserts plug into a standard 110 volt outlet and can heat up to a 400 square foot room. Infrared plug-in inserts can provide safe, comfortable heat for up to 1,000 square feet. A built-in electric fireplace insert, often installed using a builder’s box, is for people who want to remodel or upgrade their fireplace mantel. A built-in is designed to be a permanent fixture, whether you choose to install it into an existing fireplace or recessed in a wall. Built-ins require more work for installation, but each unit comes with detailed instructions and can be installed by a home owner with a decent toolset. Built-in fireplace inserts can be hard-wired into your home’s electrical system or plugged into a standard outlet using a plug kit. Built-in fireplace inserts provide heat for up to 800 sqft. A 110v insert will warm 400 sqft, while a 220v will heat an 800 sqft space. Built-ins are available in styles that work with both traditional or modern homes. Electric fireplace inserts come in many different sizes to fit most fireplace openings, so you should be able to find an insert that fits yours. The main dimension to be concerned with is the width of opening, which is typically between 2 and 3 feet. Some ultra-modern built-in units are extremely wide, however. One measurement many overlook is the distance between the firebox and the mantel. Without knowing this, you could end up with an insert that doesn’t even function! Some inserts offer decorative flashings and trim to enhance the look and style of your installation. For example, instead of a basic black sheet metal flashing, some inserts offer a cast iron surround trim. In the rare case that none of the appropriate flashings or surrounds will cover your entire fireplace openings (particularly for those with very large fireplaces), it is possible to purchase the insert only and then have a custom surround fabricated by a local machine shop or sheet metal expert. Some of the best retailers offer services to help you do this. Many electric fireplace inserts offer special features that you may or may not care about. All electric log inserts and fireboxes are designed to pulsate and glow while the flame effect is in use. The result is a realistic flame effect without the nuisance of smoke or the dangers of burning logs. How the effect will look, however, will differ based on the design and style of each of the inserts. Some flame effects are generated using a pan of water that mists. Originally patented by Dimplex, this is the most realistic-looking approach. Others mimic flames using blown air and fireproof materials. When considering a unit, look for the flexibility and controls that fit your needs. Some electric fireplace inserts offer a digital temperature setting to set and forget the target temperature for a room. Additional features such as flame brightness, on/off timer displays, and flame speed settings are also important to consider when comparing units. Finally, you can get a remote control for your fireplace, which definitely ratchets-up the cool factor. I have one and use it a lot more than I thought I would. Now that you know your size, trim, style and optional features, it’s time to shop! The good news is that the vast majority of electric fireplace inserts cost less than $2,000, making them affordable for almost every homeowner. Some smaller plug-in units cost less than $200. 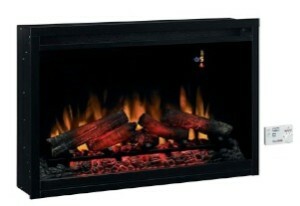 For example, the very popular Comfort Smart 23-Inch Electric Fireplace Insert/Log Set – ELCG240 retails for just $130. For a larger traditional fireplace look w/ good room heating, the 4.5 star rated 28″ AKDY Electric Firebox has a beautiful curved face and realistic log fire effects; it retails for $199. Shopping online is definitely the way to go, because most local hardware stores won’t carry that many choices on their floor and the online market is extremely price-competitive. When shopping online, you will notice that steep discounting (20-50% off) is common. This is normal practice in the industry, so make sure you take special care to look at the actual, not list, price. 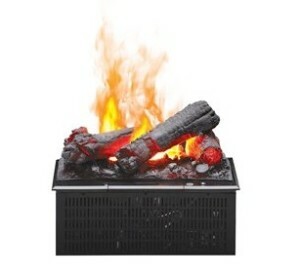 In addition to steep discounts, some retailers including ElectricFireplacesDirect.com and Amazon.com also provide free shipping on orders. Shipping a fireplace insert can cost as much as $100, so take note. Electric fireplaces are relatively easy to install. Unlike wood-burning fireplace, you don’t need to create any venting. In fact, installing most types of electric fireplaces is as simple as plugging in your TV. The method and complexity of installation will depend on what type of insert you’ve bought and where you are planning to put it. Most inserts are designed for installation in an existing but unused fireplace. You can either install a built-in insert using a builder’s box or a plug-in insert. Whichever option you use, it is important to first prepare your fireplace for installation. Remove the existing installation and clean the area. Make sure there is no water coming in through your chimney. If it’s not waterproof, install a rain cap first since the leaking water can damage your insert. Seal the chimney’s damper; you don’t need it anymore since an electric fireplace insert doesn’t require venting. 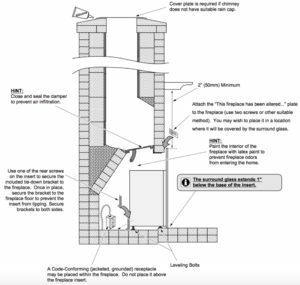 Sealing the damper also ensures that all heat from the insert only goes into the room rather than escaping upwards out of the chimney. The next thing to handle is the power source. Plug-in inserts can be connected to a standard home outlet. But you may need to drill a hole through the masonry to reach the nearest outlet. Alternatively, ask your electrician to add a grounded outlet inside the fireplace. Built-in inserts often need to be hardwired since they contain more powerful heaters. Only a professional should handle the installation. 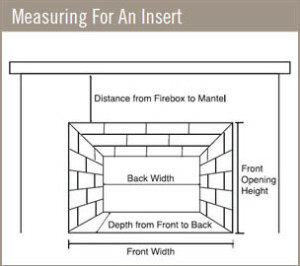 Remember to take measurements of your fireplace before buying an insert. It doesn’t have to be an exact match to the fireplace insert. Just make sure it is slightly bigger than the electric fireplace. Depending on the size of the insert you may need to place it on a platform to raise it higher. If there are gaps left on the side, most inserts come with a trim kit that you can use to hide them. Some inserts also give you the option of installing your own custom trim. 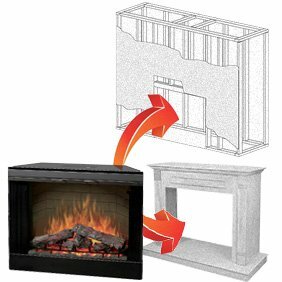 Read our complete electric fireplace insert installation guide for additional tips. You are not out of luck if you don’t have an existing fireplace. 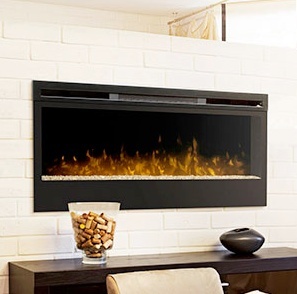 Other types of electric fireplaces can be mounted on the wall or recessed into the wall. Check the manufacturer’s specifications before you buy. Do they recommend surface mounting or recessing? Some manufacturers allow either one of these installation options. Recessing the fireplace into the wall is obviously more difficult and time-consuming. You have to cut into the wall so that the fireplace can be flush to the surface of the wall. Unless you have plenty of DIY renovation skills, I recommend hiring a pro to do the wall cutting and installation. A surface mounted fireplace, on the other hand, is something you can install on your own. The fireplace will most likely come with a mounting kit that you drill into the wall to hold the fireplace. One advantage of a wall mounted electric fireplace is that it’s easy to relocate to another wall, room or house. Some electric fireplace inserts come with their own mini-cabinet that you set up and insert the fireplace into. The only bit of work involved is putting together the cabinet since it’s often delivered disassembled. These inserts are a good choice if you don’t have an existing fireplace and don’t want a wall-mounted or recessed electric fireplace. You can also recess an electric fireplace insert in your own cabinet, bookshelf or entertainment center. It’s all about getting your measurements right to make sure the insert will fit and look great. Find an insert that is as close as possible in terms of size to the dimensions of the space you are going to install it into. If the insert is slightly smaller, you can often use the manufacturer’s trim or your own custom trim to create a seamless finishing. Note: When you install the fireplace insert make sure you test it as soon as you are done. Take note of any problems with the flames or logs and listen for any unusual sounds. If you see a problem, check the troubleshooting guide or call customer support. Once you get your new insert installed, the hard part is over. It took me less than an hour to install mine. Got it done just in time for the holidays! You can buy electric fireplaces, but on this website you will see reviews of “inserts”. If you own an older home with a wood burning fireplace and you want to convert it to something else that is when these inserts come into play. So, yes you need to build a fireplace 1st or already have one. Hello, I am getting a costum made entertainment center made and I would like t add a fireplace. Not sure night is the right one for this kind of job. 1. I have an old brick fireplace in my 1400 sq ft home. The living room is very small so I don’t need a lot of heat. The fireplace opening is 29 in height and 31 in width. Should I get a glass covered insert that would be close to these specs or just a log insert that would be open. 2. The chimney is stuffed with insulation. Is that dangerous ? 1. Either type of insert would work fine. 2. Insulation in a chimney can be very dangerous if the insulation is not covered w/ an up-to-code fireproof blanket/lining. That said, if you are looking for an electric insert, you probably don’t need to worry too much about this because they don’t vent off that much heat. 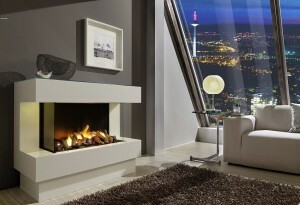 I’ve only ever really considered a freestanding electric fireplace, big fan of the insert ones now too! Going to have to pick one up for our old farm house. Thanks! I have an open fireplace that sits between my living room and kitchen. Both rooms can view the flame.Presently I have a gas insert in the opening and the propane fumes make it impossible to run because they are so pungent. Can you suggest a unit I should buy that is electric with a heater? The vast majority of see-through fireplaces are either gas or ethanol. Dimplex makes a few 2-sided electric fireplaces, for example this 39″ unit. But they are not cheap. Are there any electric units for a double sided fireplace? Paula, see my reply to Fred Brown, above. Which type can safely have a tv mounted above the insert ot builder’s box? I am building into a 80″ high by 72″ wide niche where a tv can be mounted. Most non-heating fireplace insert units will work fine. Some heating fireplace inserts are well-insulated on top w/ ventilation tubes that will route around your TV. The safest bet: make sure you’ve properly insulated the TV enclosure against heat – even if the insert says it’s insulated. People become so confused about choosing Heater because here are wood stove, pellet stove, Insert, fireplace, fireplace insert and so many kind of heaters available in the market. Your information is certainly will help those want to buy Electric Fireplace Insert. To heat a room of 1,000 sq ft, you’ll need a unit that provides least 5,200 BTUs of heating capacity. We are building a new home and I would like an electric insert, I do not want gas. We will have a fireplace but am not sure if we would need a sub zero or insert. We will not have a real chimney, there will be a mantel with the stone around it and everything but no real chimney. I’m confused as to what this all means. I do know the contractor is trying to dissuade me from getting electric because he says I won’t get much heat. Is this true. We want to use the fireplace everyday when it is cold. You’ll need about 5,000 BTUs of heating capacity for each 1,000 sq ft in a new/modern/well insulated home. Most electric fireplace inserts provide 4,000 to 6,000 BTUs of heat, to give you a feel. I purchased an AKDY 33 inch electric insert. My fireplace opening is 41 inches wide and 27 inches tall. My 33 inch insert has room on the sides but the height was 26.50 which was the closest I could find to these dimensions without it being very costly. Now I cannot find a trim kit that will cover the open areas around the insert. Do you have any recommendations that aren’t over $100? Sorry, but I couldn’t find any that match your specs. Might need to get a local fabricator/craftsman to make one for you. Most carpenters & HVAC repair people know someone like that. How would I plug it in if the outlet is outside the fireplace? If you want to hide the cord, you will need to install an outlet inside of your fireplace. Do this after you close and seal your flute / chimney. Hi, i bought Dimplex fireplace the type with a like glass crystals. It is beautiful but in couple of days it developed an annoying sound which repets every about 4 seconds. Is this fixable ? was looking at the electric insert logs for an existing fireplace. I’m concerned about forgetting to shutting it off at times and wanted to know if these units shut off automatically. Yes, many of them have automatic shutoff – as well as timers you can set. Best way to close and seal chimmney and flue prior to install? 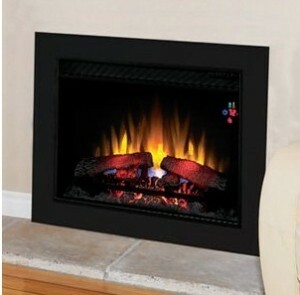 Read my Electric Fireplace Insert Installation Guide to learn how. We have an opening which has a chimney to roof where a pellet insert was and removed. The opening inside isn’t brick other than the outer wall face mostly decor. Can i build a wood box insert and put inside the opening and put a freestanding electric log heater in there? opening is about 30×36 and then insulate around the wood insert so no heat goes up old chimney. Just not sure if the insert box can be wood or not with the heater? Yes, you can build a wooden box to place an electric fireplace insert in – especially if you use a “builders-box” style unit. Builders box inserts are specifically designed to be installed inside a wall or in a wooden box. Be careful with log-style units that heat, however. You need to make sure they are inside an engineered enclosure that is designed for fire safety. Free-standing units rarely heat, but if you find one that does – do NOT place it inside a wooden box (for obvious reasons). I noticed that the electric fireplace inserts have a vent on top of the unit. I want to build a structure around the insert to lay fake stone. I’m sure that top vent cannot be covered up so is there a certain clearance that I need to make sure I give it? Most electric fireplace inserts and fireboxes are self-insulated and do not require much space between the box and your wall, if any. Less than 1″ is fine for most. Make sure you check the installation instructions carefully, however, especially if the unit is a heater with a high BTU rating. Most high-BTU heating units also require ventilation, but usually that is done through front-facing vents not behind the unit nor on the sides (for obvious reasons). I read your very good information at the top but wanted to know more about infrared heating electric fireplaces. I currently have a wood burning stove inserted into a wood burning fireplace. I have no idea what is happening behind the stove. I would like for this electric fireplace to replace the single baseboard for this ~800 sq ft space with vaulted ceiling. The house has outstanding passive solar heat. Typically, in the dead of winter on the Northern California coast, after having been absent for a couple of weeks where NO heat was on, we turn the single baseboard on to 68 F. Within about 2 hours we need to turn it off as the house has become too warm, even on foggy days. I clicked on your “infrared” link and the link is broken. Have you seen the ClassicFlame 26″ Infrared Quartz line of heating electric inserts? They are excellent high-BTU heating units (1,000 sq ft) that are technically “builders box” inserts, which means they are meant to be installed flush in a wall or inside a containing box. But you can build your own box if space permits. Less than $300.